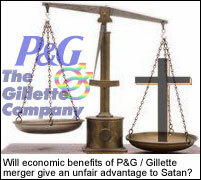 A coalition of Christian groups is calling on the Department of Justice to block the proposed merger between Procter & Gamble and razor giant Gillette because of P&G's ties to the Church of Satan. If the corporate marriage is approved, the new corporation will be the largest in the world to be controlled by Satan worshippers. $57 billion question: what percentage of the new company's profits will be donated to the Church of Satan? CINCINNATI, OH—Just days after household products giant Procter & Gamble announced that it would be swallowing razor giant Gillette Co., a coalition of Christian groups is warning that the corporate marriage would create the largest company in the world to be controlled by Satan worshippers. The groups, which include the Campaign for Families, Defend Our Marriages and the Coalition for Traditional Values, are asking the Department of Justice to block the merger on the grounds that it will give an unfair advantage to Satan in the battle of good vs. evil. The American Family Association submitted its own complaint, objecting to Procter's support for what it calls "the homosexual agenda." News of the proposed mega-merger sent stocks of the two companies up sharply Friday, but many questions remain. What will the new entity be called? How many jobs will be cut as Gillette and Procter combine operations? And what percentage of the new company's profits will go to the Church of Satan? While the Gillette Co. has no known ties to the Church of Satan, Procter's relationship to the devil dates back decades. During the 1960's, Christians who looked closely at the corporate logo, a moon-star symbol that had appeared on many of the company's products since 1882, saw not 13 stars representing the 13 original colonies as the company insisted, but something altogether different: the Mark of the Beast. The arrangement of stars, noted these witnesses, secretly spelled out the numbers '666,' immediately recognizable to students of the Bible as the digits of the devil. While Procter dropped its satanic logo in 1985, there's no word yet on what logo the merged companies will use, and whether the new image will incorporate the mark of the beast. Analysts note that in recent years, Procter has worked to update what has long been a staid image, and is thus unlikely to reuse the satanic logo from its past. Procter took its relationship with the devil public in 1994, when then CEO Durk Jager allegedly appeared on the Phil Donahue and "came out" as a Satanist, acknowledging that a large portion of P&G's profits goes to support the Church of Satan. Jager proclaimed that he felt comfortable disclosing Procter's ties to the Church of Satan because of the openness of American culture. When a visibly startled Donahue asked Jager if he wasn't worried that his company's close ties to Satan might weaken Procter's market share among Christians, Jager was quick to respond: "There aren't enough Christians to make a difference." Jager later allegedly appeared on the popular Sally Jesse Raphael show, where he again announced that Procter was controlled by Satan worshippers. The proposed merger will create a global powerhouse, marketing everything from deodorant to dog food. Analysts say that the marriage of P&G with its non-Satanic competitor is necessary if the companies are to fare successfully in a retail era dominated by Wal-Mart. While Wal-Mart has no known ties to the Church of Satan, many Christians have warned that the retail giant's introduction of radio frequency identification devices to monitor supply and demand of its products could portend the arrival of the economic system that the Antichrist is expected to implement. According to Revelations 13:16, everyone living under the Antichrist's economic system will be required to receive an implant in his or her right hand or forehead. 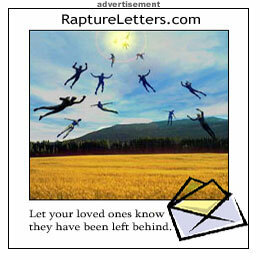 The Rapture Ready index, a prophetic speedometer of end-time activity, experienced a slight drop in its Mark of the Beast category upon news that Wal-Mart's implementation of the radio tags had run into problems. The rumors that there was a talk show and they talked about P&G and their association with the occult is TRUE because I watched that show myself. I do not remember which talk show that it was but I did watch a show. The way I remember it they did not say satanism but an affiliation with Wicca and the logo was still in use as late as 2003 on toothpaste. I have news for you. The rumors about Procter and Gamble are just as false as the rumors of God's existence. Completely. As a Pastor I am ashamed of the proliferation in christian circles, of such nonsense. One thing is for sure and that is if Satan desires to make Christ's followers look like fools- then maybe it is he that is behind these unfounded and rediculous rumors, he is the father of lies. For Christ's sake, check out the truth so as not to make His body look like a fools in the eys of the world. (I'm sure some of you will take "for Christ's sake"meaning for His sake and the sake of His Church out of context and call me a blasphemer. )God help us all! What a bunch of morons you all are. P&G is a publicly traded stock company. The profits go to the indiviudal shareholder and the CEO can not distribute them to a church without full disclosure to the IRS. Look it up dumbasses. If they had donated to the church of satan you could find out definitively by looking at the public records which are available to anyone with enough sense to look. But it is obvious you guys aren't smart enough to do this. Guess what the merger with Gillett went thru. You guys are the kind of Christians who give christians a bad, like the dumbasses who won't let their kids read Harry Potter books or watch the Wizard of Oz becuase it is witchcraft. It's fiction dumbases just like this fictitous P&G rumor. It is, and always has been, a hoax. You people are idiots. Do a little research before you start spreading rumours. Arhhh, how annoying that people actually believe this rubbish!!!! It seems impossible that the rumor of an appearance by the President of Procter & Gamble on DONAHUE is still circulating after more than a decade. There is absolutely nothing to this rumor. The president of P&G has never appeared on DONAHUE, nor has any other P&G executive. Anyone who claims to have seen such a broadcast is either mistaken or lying. It never happened! Are you trying to scare us Manford, do you work for P&G ? Hi, I have been listening about the subject since I was 12 years old(24 year ago), some catholic groups in Durango México gatter to talk about the matter, but I don't remember more. I have been reading a lot now on this ropic, but there is no evidence, let me know if you find something. I am still lokking for the number 666 in the drawing, but can't find it. I think I will need some help from the experts. Bunch of idiots. These americans are neurotics!!! I have been reading alot about this P & G rumor and I can't believe what I am seeing. I personally watched that episode of Donahue with the president of P & G on it and can tell you it did happen! I am not a Christian or even anyone who would be detered from buying P & G products because of this, but I can't believe how this is being so easily denied by everyone. The crazy thing about the whole situation is that the discriptions of the show the statements and the shocked look on Donahues face are all being discribed exactlly how it happened. The show in question did occur. Phil is a major intellectual of our times. One thing though, the show included "Strippers whose Mom's are married to Midgets". In it, Phil was very concerned about these poor strippers. Happen? Phil would invite Satan himself on if he thought he could improve ratings. I see alot of debunking going on of this so-called urban legend,and it's been said that Phil Donahue says that he's never done such a show,blah blah blah.But I vaguely remember seeing an episode of Donahue that did atleast talk about the allegations that Procter & Gamble is involved with satanism.I know that Donahue says he did no such show as far as one where the P & G executive admits to it.But did Donahue atleast do an episode on the P&G & satanism topic? I believe he did and I believe I may have seen part of that episode but it was so long ago it's hard to recall.I want to know if Donahue atleast admits doing a show about the allegations because I'm almost certain that he did and if he denies even having a show like that then I'd start to be more suspicious about this.I do believe he atleast did a show about the alleged satanism of P&G.If they atleast did that then they need to admit it and air that episode so we can see what did transpire on that particular episode.I'm pretty suspicious of the debunking of this stroy because I'm pretty sure I remember seeing atleast the story of the allegations (not saying anyone admmitted to anything on the show,cause I don't know) on the Donahue show before.Somebody needs to find this out because I think the Donahue people might be lying about this if they deny even doing a show on the topic.They say they did no such episode where any P&G exec made any admissions of satanism,fine.But what about an episode about the story of the alleged allegations? - Enquiring minds want to know!!!!!! You poor ignorant people. This has been a FALSE RUMOR for 20+ Years. Whomever has enough brains to research will find P&G is one of the Country's outstanding Corporations. Beware what you write on your site my friends, P&G will know shortly and most likely take legal action. You deserve it. Fifth Journalist Denies Exchanging Print Praise for White House Favors A conservative writer who penned praise-filled prose about President Bush and his policies and accepted complimentary tickets to the "Heroes, Red, White and Blue" inaugural ball, and an array of inauguration-related memorabilia is denying any wrongdoing. Deanna Swift says that by accepting the gifts, she may have "opened the door for liberal media attacks" on her popular conservative blog. Bush State of the Union to Identify New 'Axis of Evil': SpongeBob, Buster and Winnie the Pooh In the first State of the Union address of his second term, President Bush is expected to warn Americans to prepare themselves to confront three cartoon “evildoers” in their midst: SpongeBob, Buster and Winnie the Pooh. But despite tough talk from the White House, insiders say that the administration is deeply divided on whether to open a new line of attack against Buster before declaring victory in its campaign against SpongeBob SquarePants, the openly homosexual underwater cartoon icon. Todd Fox and Deanna Swift are seasoned professional journalists.